By exploring complexity and chaos theory, with its “strange attractors,” “phase portrait,” and “bifurcations,” we explore a world where order or meaning is created without a designer but rather out of an intricate system. Mythic consciousness and its practice, ritual life, requires a telos to create momentum–the dynamics of consciousness. Psyche is a mirror, as matter is a mirror of imagination. The fictional carrot is ever-present before us. As a culture, we are in the position of having to take ritual fictions (including scientific theories) seriously, while recognizing their status as fiction at the same time. This means being in two ontological “places” at once, facilitating the development of new ways of thinking about the nature of knowledge, being, and reality. According to Hillman, it is “spirit’s self-knowledge in the mirror of the soul, soul’s recognition of its spirits.” The “new myth” seems to be one of “guiding fictions,” even “healing fictions.” Mythic consciousness and its practice, ritual life, requires a telos to create momentum —the dynamics of consciousness. The Field is the only reality; we are essentially standing waves in space. We suggest that spacetime and matter are the emergent properties of a more fundamental entity, where all fundamental forces are derived from one field. Field theory is a holistic theory which examines patterns of interaction between the individual and the total field, or environment. We use such concepts metaphorically, even if they are mathematical models. Self-knowledge is an emergent field of information — a conceptual epistemology of the dynamic psychic field — how we know what we know and what it is like in endless iterations. Somehow we process information without understanding fully just what informs us. The dynamic field is like a stream, constantly flowing while changing slightly. Of course a magnetic field is not a stream of fluid, but as a mental picture, an imaginary fluid streaming in the direction of the magnetic field lines is quite useful. The magnetic flux through a given area is a measure of this imaginary ‘streaming’ through that area, much like the imagery of our stream of consciousness. We think and talk metaphorically, and all metaphors are both technically wrong, yet embodied. Wrongness is what makes metaphors meaningful. For one thing to be like another means they are not the same, yet are meaningfully similar. Mind is inherently embodied. Thought is largely unconscious. Concepts are mostly metaphorical. Mind matters deeply. It’s analogous to undifferentiated psychic energy or libido — the fuel of instincts – be it power, hunger, hatred, sexuality, or religion, aggression. Jung thought, libido can only be apprehended in a definite form; it is identical with fantasy-images. Myths, and their corresponding symbolism, are libido analogues: symbolic manifestations of psychic energy. Jung thought of four general modes of application within the personality: progression, regression, extroversion, and introversion. Field theory has the idea that no part of a person’s field can be viewed as being pointless. Every part of a total field must be viewed as having possible meaning and importance. This must be done regardless of how pointless or non-important the part of the field may seem, it should still be accounted for. Emergent phenomena correlate psyche and matter. The emergence of life in the universe is itself a process of self-organization. 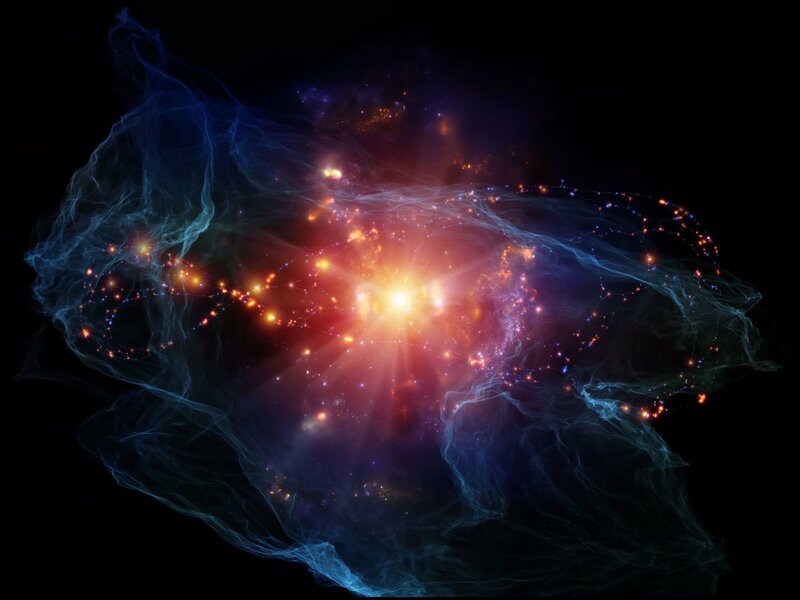 Noetics, direct knowing, is the connection between mind and the physical universe – how the ‘inner cosmos’ of the mind (consciousness, soul, spirit) relates to the ‘outer cosmos’ of the physical world – the somatic field of our psychophysical being. A noetic field consists of all mutually interdependent facts and symbols. All are components of the ritual field of mythic sensibility. The mythic field is the realm of the unconscious. The form of myth emerges as patterns from the field of the Collective Unconscious. Pattern is a language, using fields to describe dynamic relationships and energetics. Each pattern is a field. The field of myth is emotional — emergent, resonant, challenging — inviting ritual enactment to animate and embody it. Thus, we recognize and develop our own style of mythic consciousness, stepping in to join with others, daring to live our larger lives within the field of historic life. Such journeys are rites of passage. Components of the unconscious emerge in conscious life. Personal myth is a biochemically-coded internal model of reality and a field of information. It shapes individual behavior as cultural myths influence social behavior. Symbolic content is a mythic field. Shift the field, change the myth. Rituals shift the field. Transcendence parallels the emergence of myth as new life experience. Jung described the transcendent function as a reconciliation of conscious and unconscious elements, remapping our boundaries. Metaphors are interpretations of reality. We can imagine an incidence field and an emergent field of experience. The totality of an individual’s field seems to have no bounds, as epigenetic research shows, due to the change in field. This is a good example of how broad field theory can span, as a personal pre-consciousness may be altered due to field changes that occurred before any major development. The mind is enveloped in the full universal nature in a complex conscious universe with inherent self-organized teleological principles governing its evolution. Noetics is a branch of metaphysical philosophy concerned with the study of mind and intuition, and its relationship with the divine intellect. Consciousness emerges from the noumenon of the conscious universe. We understand emergent intelligence in terms of a field effect rather than trying to reduce it to Newtonian mechanics. Field theory can model subjective human behavior and cognition as an emergent property of interacting psychological fields, rather than as a causal network of variables as it is in the classical worldview. The modern human soul emerged with the appearance of art. We return and reconnect back with the moment of emergent soul each time we encounter our images. “Self-organizing” processes produce emergence. Knowledge and experience create a feedback loop, an emergent, flexibly changing field. Once emergent the field influences the lived experience. impacted by non-specific aspects of the ambience of the emergence field. Permutations in the field result from recognition of patterns of motivation and dream imagery. Emergent phenomena are variations of variations, a virtually infinite repertoire of imagery and novel explanations. Perspective transformation is cognitive and emotional. Self-exploration is a functional probe field. Transformation of meaning is linked to therapeutic change, a modification of behavior by modifying attitudes and beliefs. Important traits include extraversion, openness, agreeableness, conscientiousness, and emotional stability. The progression here is to an emergence and giveness we can articulate as physis, self-emergence and self-unfolding. Transformation is self-initiation. The initiatory journey is “instinctive self-initiation.” Life is an individual journey, no one can solve it for us because there is only self-initiation. When a dream-figure is compared and contrasted to figures from mythology and religion, literature and art, the dreamer is initiated into an awareness. We undergo a process of inner development, or the initiation into inner reality, involving the exploration of, and adaption to, the inner world of the unconscious. Initiation results in an intimate encounter with our destiny. But more, our wounding activates a deeper, transpersonal process of potential healing and illumination that we could not have initiated by ourselves. The integrative potential within us is self-realization. Emergence is the essence of paradigm shift and self-transformation. Few of us pass the full extent of our lives comfortably reconciled with our natural selves. Even prosperity and success cannot silence the grinding notes of discontent and unlived potenrtial that trouble our days and disturb our dreams by haunting our sleep. In dialogical emergence our narratives address evolutionary, developmental, and functional emergence. However, intelligence emerges with symbolic language. The primitive spirit expresses many phenomena including paradoxical opposites by sexual metaphors, mystical, and generative unions. Metaphors create realities in our conceptual system. We relate emotionally to the notion of ‘transformation’ in typical metaphors, such as from being asleep to awakening. At best, they are “as if” realities. Classical metaphors of transformation include death to rebirth, darkness to enlightenment, fragmentation to wholeness, journey to destination (arriving; homecoming), and organic unfolding. What is the journey? What is the search? In the master narrative, we are travelers, or miners, or ascender/descenders. In the poetic tradition, primary imagination has the ability to form a central image in ourselves. It makes sense of all the disparate besieging images. A primary theme is the unification of paradoxical opposites in sexual imagery. Identifying this focus, pictorial intelligence, holds the many images and complex qualities, knows where to place itself, and exactly what to say. Each person’s authentic voice emerges through the basic tenets of expression: writing, listening, movement, self-inquiry, gesture, intonation, and speaking aloud with personal authority in a way that is humanly poetic. Fully engaged in the world around us, we discover an innerness without which dedication to soul life is impossible. 1. The essential purpose encoded within every living thing. 2. The life force that drives the full evolution of an organism. 3. The dynamic principle that realizes or actualizes what is otherwise merely potential. 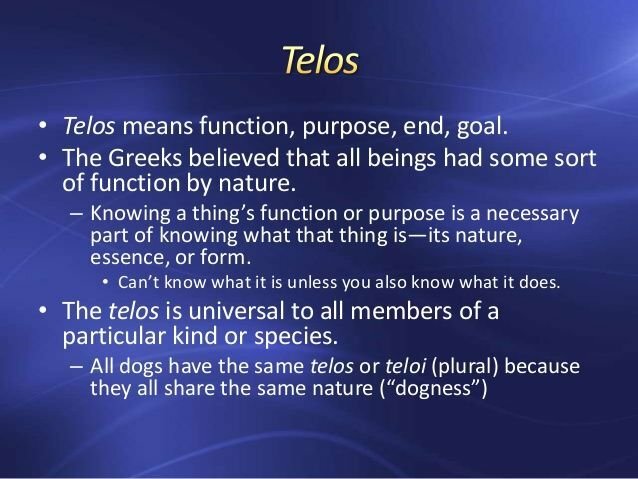 Telos is our desinty or innate potential for becoming. Wholeness is the goal and end-point of conscious realization. Our task, as we journey through life, is to listen to the still small voice of our soul as it struggles to remember what it already knows about who we really are. But we cannot know the end at the beginning because spontaneous possibilities arise and emerge along the way. Our destiny leads us to soul-work; telos is the urge that propels the soul. Affects have telos, and it is through the transformational process that the telos is invoked. The locus, of our eternal individuality, the telos of that spiritual motion is the Angel, genius, or daimon. the “telos” or end-goal of eternity is not just at our personal end or the end of time , but in each moment. All psychic events have an innate telos. Telos compels life force. Aristotle’s philosophical telos is final purpose, “that for the sake of which” something exists or an action is done. Our ‘end’ pulls us forward from the very beginning — a sort of psyho-iretrocognition. For example, if the final purpose of aging is character, then character finishes life, polishes it into a more lasting image. We cannot cure and eradicate pathos, or discard old myths to replace it with a new one. Individual telos finds its expression through our vocation, our calling. Recognition of fate is not fatalism. We have a latent purpose but may fail to recognize it, however, its literalization into definite, overriding goals must be avoided. Hillman says to follow the image is to discover the “telos,” direction of the soul’s path, its destiny. This telos is also clearly illuminated in the body, which is also a metaphorical field. Psychic events have a telos or integral aspect. We sense their purpose is therapeutic. Imagination bridges body and soul — the material beating heart and the imaginal heart. Looking or seeing through events and things to their imaginal image is not a method, but a way of living. Subjective perspectives deepen vision, reflection, rhetoric, values, and ideas. The telos, the inner direction and goal, of the Western mind has been to reconnect with the cosmos in a mature participation mystique. Telos is the prospective aspect, or forward-looking aspect of the psyche, that within us which is looking to the future and signaling the potential and even the necessity to grow and develop. Jung (1977/1917) “the pull of the future,” is part of the dream’s mysterious energy, clues about the future possibilities available to us from the perspective of the unconscious. Darker images reflect necessities. Telos even shows in our symptoms as the purpose of the symptoms and the masks and fictitious roles we are destined to enact. As well as metanarrative, we can also notice the phenomena that happen along the way as we work with images. The image’s movement expresses the telos, a kind of manifestation of the god within, and it is followed, not interpreted. Each dream presents the full narrative: tension, telos, and treatment all within the sense data of the image. We embrace feeling tone, “plot” and telos, amplification, dominant(s), and personal associations. Entelechy, in philosophy, is emergent evolution, genetic intelligence, the kernel of the ‘true self’ — that which realizes or makes actual what is otherwise merely potential. The concept is intimately connected with Aristotle’s distinction between matter and form, or the potential and the actual. This dynamic purpose is encoded in us. Defining characteristics of this experiential process include emergence of the authentic self, self-actualization, or self-realization. They are expressed in the emergence of spirituality and integrity; wisdom, understanding, and compassion; a realistic self appraisal; and a continued ability for evolutionary change and creativity, with the emergent potential for and possible stabilization of illuminative or unitive experiences. Personal experience and expression of existential, humanistic, and transpersonal goals can lead to fulfillment of human potential. The direct experience is of wholeness, personal connectedness and expansion of consciousness. A relationship with psyche extends our view of reality beyond the material. Our awareness can journey beyond the mere body, emotions, and mind to perceptions and insights which enlarge our sense of self-image in a functional and evolutionary manner, superseding merely personalistic, narcissistic, regressive tendencies in a permanent reorganization. These experiences occur in the context of normal adult passages, the spiritual quest, and in the psychotherapeutic setting. Sometimes expansive experiences are initiated by the awesomeness of nature, alone. It is an informing spirit that gives life to something and our faith in life. “This entelechy principle can be expressed symbolically as a god or a guide. We feel its presence as the inspiration or motivation that helps us get life moving again after times of stress or stagnation. There are many ways to engage the symbolic forms of the entelechy principle...” (JeanHouston, The Hero & the Goddess, 1992) It guides our authentic choices, clarity, and creative flow. Light illuminates the transparent imaginal. Aristotle present a playful analogy between light as what makes things visible and man, and so perhaps cognitive soul. If light is the first entelechy of sight in its actualizing of the transparent, then it is analogous to the living body actualized by soul. Everything is made of Light. Only light matters. Nothing arises but standing waves from the seething zero-point field. Each and every one of us is unique and significant. We exist for ourselves and not for another. In the last analysis every life is the realization of a whole, that is, of a self. The development of the spirit, self-realization, goes hand in hand with an enlargement of the area of consciousness, and every step forward is an extremely painful and tiring achievement.